When I do property readings, I do an energetic scan of the land to see if there is anything present that needs healing. I come across all kinds of interesting energies including legitimate ghosts (souls who have not crossed over and could use some help), physical trauma to the earth, earth energies like vortexes, and more than once now I have encountered land that has more than one “reality” present. Like multiple timelines happening simultaneously. In one case, I encountered a native chief whose people were rounded up and removed from the area hundreds of years ago. He told me that he had energetically protected the area for his tribe, and that they continue living on there, just as they always had, in a parallel existence. In that case, there was no work for me to do – they desired to coexist on the land in this way and I respected their wishes. But after encountering another similar situation recently, I decided to check in with my guides to specifically ask about multiple timelines present on land. For this channeling, I worked with two Young Living oils: Sacred Mountain over my third eye and Sacred Frankincense over my heart and a drop on my hands, inhaled. My regular Bigfoot guide arrived right away, but my Cedar Tree guide also appeared for this session. This guide has spoken to me though readings I have received from other people, but never came through to me directly, so I knew this message was going to be different, somehow. Cedar told me that there was a message for me in the reading and that they have been waiting for me to ask this question. Uh oh. That always makes me a little nervous! A native man in a headdress then appeared and let me know that many things are energetically possible on the land. When trauma is present, sometimes it’s easier to separate from that trauma than to experience and heal from it. I pointed out that was similar to how multiple personalities are created in people, but he said the issue there is that our bodies don’t have the ability to hold all of that energy simultaneously. The earth can handle it much easier than we can. When these multiple timelines are created on the land, they’re kind of like geological layers, one on top of the other and they can go to into infinity. We think we’re living in the only “time” on the land, in our homes, but we’re present in just one of many possibilities. Sometimes we can detect those other layers, if a little bit leaks over the edges – like a glitch in the Matrix. Have you watched the show Stranger Things? My guides say the upside down is another layer. Another possibility created at a certain point in time that lives on, energetically. I asked if we could visit these other layers and they said that we can, but that there isn’t much point to doing so and that there’s no real damage being done to the land or anyone present, however, if you’ve ever visited a place and felt SUPER heavy, thick energy, it’s probably because there are tons of layers present. That being said, trauma is not the only thing that creates these layers. We can create them with happy energy as well. Places we love or yearn for. However, we need to cut our cords with these places when we leave them, otherwise a small part of us is left behind and continues to live there. Acting out that life as if we still lived there. Just another possibility of what might have been, if we hadn’t moved on in our lives. My guides showed me the movie A Christmas Carol. Where the main character is visited by the ghosts of Christmas past, present, and future. We can go peek in on those lives, but it’s never going to quite be what we want it to be. It’s just a shadow, or a remnant of what was. We need to call all of these pieces back to ourselves if we want to be fully present in our own lives and lighten up the energetic load in the places we’ve left behind. Once we are fully integrated, we can fully pursue our life’s work. Ahh, here we are. The message for me. Except, they told me to share this with you too. The process that my guides are explaining here is called Soul Retrieval. Soul Retrieval is a shamanic healing technique in which we visit small parts of ourselves that we have left behind, and integrate them back into our current energy bodies. My guides gave me a guided meditation to call back these pieces of us that we have left behind in specific homes or places in our past and you can access it in my free Resource Library. However, if you have not done a soul retrieval before, a few words of caution. This is a very powerful healing technique and you must do it with intention. Know that it can be triggering, as you will be visiting places in your past or could revisit past trauma. Be sure that you have people you can reach out to for support afterwards, if that is needed – a spouse, close friend, or therapist. Drink plenty of water and get lots of rest for a day or two after. You will process a lot of energy and may need some extra self-care. Be sure to take notes on what you learn or are asked to do during the meditation. It takes a full 21 days to integrate soul pieces and, during that time, those soul pieces need to know that you’re serious about welcoming them back. It’s up to us to do the work, or the piece may return back to where you left it. 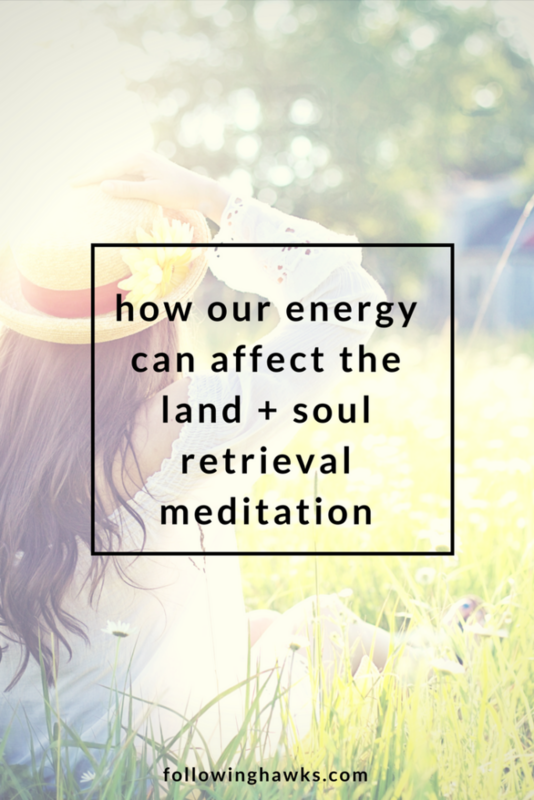 I don’t want to needlessly worry you about soul retrieval – I have done it many times and often it’s a powerful and emotional process after which you feel much happiness and relief, but this is not a simple meditation, it’s strong shamanic work so I don’t want you to be surprised. Feel free to do this guided mediation as many times as you’d like to visit all of the places in your past that a piece of you has been left behind. Let’s all do our part to lighten up the energy we’ve left behind on the land and get to work pursuing our purpose!